romance and social strata in the realistic backdrops, the film has shot up its fame winning incredible appreciations. While Karthi’s scrupulous efforts to make a trenchant mark is highly talked about with positive reviews, the prodigious style of Ranjith’s narration grabbed everyone’s attention. A team brimming with actors and technicians burning candles at both ends now tastes the essence of guts and glory as Madras completes 50 successful days run in box office. Madras produced by K.E. Gnanavel Raja of Studio Green Films was released on September 26, 2014 and opened up to positive reviews with each and every element of this film graciously appreciated. 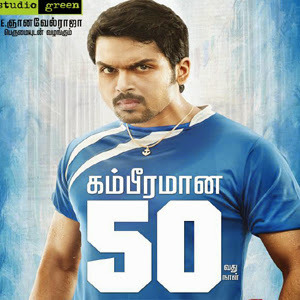 Starring Karthi and Catherine Tresa in lead roles, the film boasted of power-packed performances of new actors.